Wouldn’t it be great if you had a friendly pianist who would be available at your whim to play with you? And how much better if this accompanist were a true professional and elevated your playing? I have such a friend: my sister, who lives 600 miles away, so not a great option. I also have a wonderful friend who I do play with often, but she’s not exactly living next door so there is some effort involved. There are other choices. One is Pianoescort on YouTube. There are some recordings for cello that you can use, free of charge, but there isn’t a large selection. Maybe you’re looking for something that isn’t available. Let me introduce and welcome you to PianoAccompanimentsTracks.com. There are some recordings that are free, and others are available for a nominal charge, depending on the piece. You can hear a sample of the music before you purchase. But be warned, the playing is so good you’ll be wanting it and more. I was looking for an accompaniment to Meditation by Thais. PianoAccompanimentsTracks had a recording, but it was for violin. I emailed them to ask what key it was in and got a speedy reply telling me it was in D. Too bad, as I need it in G. No problem, was the response. And before I knew it, I had a recording that was beautifully expressive, played by a very talented pianist. In Italy. And now it was next to me and an inspiration to my playing. All for $4.49. A bargain to me. You should check it out. You too could be inspired! I had to learn 12 pieces for a special Palm Sunday service. We received the music only 10 days before the service. I buckled down, loaded the music into my iPad Pro, transferred the recordings they gave us onto my computer, then onto my ipad, then into Amazing Slow Downer so I could play along with the music. Then the task of going through the music, marking fingerings, repeats, noting dynamics, changing key signatures, changing time signatures, and generally trying to figure it all out quickly. I felt pretty good about it when we had our one and only rehearsal one week later. Until this. Don’t be thrown by the 6 flats. That was the least of my problems. I had practiced the rhythms. Once you get the hang of it, it just continues for about the next 100 or so measures. Or it seemed like it. What I failed to practice was going from several measures of half notes, lazily counting 1-2-3-4 and then changing to the 1/16 note pattern. It took me several measures in the rehearsal before I got the hang of that rhythm and was able to play it. Actually many more than “several”. But I learned a great lesson. First of all, it’s great to go to rehearsals and make mistakes. This mistake was huge for me. I had practiced the rhythms, but not changing my internal pulse and my counting BEFORE I actually got to the changes. What I needed to do was to start the new rhythm internally in the half note measures before they started. When I went home after rehearsal and figured this out, it made such sense that I wondered why I hadn’t considered it before. BUT OF COURSE I was so focused on notes, fingerings, shifts, etc., etc., etc. There are lots of things we have to do as cellists. It’s a good thing we get to rehearse, make mistakes, and then have the opportunity to work through them so we can learn for the next time. I spent last week at SCOR camp. String Camp On the Road as I like to think of it, also known as String Camp of Rochester, as the home base is Rochester, NY. If you live in the USA and you haven’t experienced a SCOR camp, you are missing an opportunity unique to amateur adult string players. If you don’t live in the USA, come on over! In addition to SCOR camp, I had several out of town SCOR friends at camp and rehearsals and concerts for 3 orchestras. It was a busy week and I’m not ashamed to say I didn’t even take my cello out of the case yesterday. Well, a little ashamed. One of the many excellent sessions at camp included “Understanding Learning”. The basis was that adults do not learn the same way as kids. I think we all know this intellectually, but there are a few ideas that are worth drilling. My favorite was in the “Knowing vs. Doing” section. We are smart. We are grownups. We understand the premise of how playing a string instrument works. What I fail to remember is that playing the cello is a very physical endeavor. I am working with an older body. There just isn’t the flexibility of an 8 year old. My third and fourth fingers haven’t been trained to stay rounded and after 50 years, they do not want to start doing so. My brilliant brain understands the idea of shifting. It’s really not that complicated. My body, however, needs a lot of repetition to remember what it takes to make that shift. So while “a lot” may mean 10 times for an 8 year old, it means hundreds of times for a 64 year old. As we learned at SCOR, skill repetition is not for your brain. It’s for your body. Of course your brain understands it. Your older body needs more training. Skill training is for your body, not your brain. So while I may never coax my third finger to be rounded, I can practice that octave shift so many times that my arm (not my brain) has learned exactly how far it needs to go before I land my fingers on the string. I stop thinking about it and let the physical process do what it has been trained to do. That is Doing, not Knowing. But do I sound like a cellist? This is a question I frequently ask my teacher, my duet partner, or my husband, who always gives an emphatic yes, but he’ll be the first to admit that he has no musical ear at all. What I’m really asking is do I still sound like a squeaky first grader? I think there are many items which contribute to sounding more like an intermediate cellist and less like one in the begining stages of study. Certainly intonation is important, as is having a lovely vibrato. But one thing that seems to be more elusive to me is articulation. From Wikipedia: “In music notation articulation marks include the slur, phrase mark, staccato, staccatissimo, accent, sforzando, rinforzando, and legato.” More simply, articulation is clarity in the production of successive notes. So it’s about playing the note in a certain way (short, smooth, loud…) that sounds… correct. Of course, you say tomato and I say to-mah-to. Or putting it another way, beauty is in the eye of the beholder. I guess the same goes for listening. There are certain things that “beginners” do that “non-beginner’s” don’t do. One of these is a “zing” at the end of a phrase. Yes, sometimes we get louder at the end of a phrase (think of endings to many symphonies) but often we’re getting quieter. Think of it as you are speaking. Your voice typically goes down in volume at the end of the sentence (unless of course, you’re having a discussion with your 16 year old about driving). It’s so easy when you’re now changing bow direction and you’re on a down bow and you’re at the frog and WHAM it’s loud. And you’re so happy you played the right note and you’re thinking about counting the rests and getting ready for the next entrance that you’re not…listening. Thus the problem. Or you want to get to the frog and you’re getting pretty far up the bow so you play that 1/8 note fast and long to get back to the frog. It sticks out and you didn’t hear it because you’re thinking about so many other things that listening is far down the list. There’s no quick solution. We have to practice listening to ourselves. Maybe turn on that recorder. Maybe just memorize a phrase (ONE phrase), then close your eyes, play it and listen. I’m as guilty of not listening as anyone, maybe more so since I’ve had my hearing tested and it’s not 100%. But I think it’s more that I’m doing the other things and putting listening last on the list. It’s going to take practice, but I think it’s another skill that needs more attention. There are several cello sites on Facebook, and being a cello-nut, I tend to check them out. The downside is that it takes a lot of time away from actually practicing. The upside is that there are a lot of adult amateur cellists who have a lot of great ideas about playing the cello. From technique and books to instruments and products. Everyone has an idea and opinion. Which brings me to the latest one that really seemed to generate a lot of comments. Rosin. What kind do you use? What works the best? One writer did an entry about Andrea Solo Cello Rosin. He was funny, saying how much the rosin improved his sound, but he was sincere as well. There were many, many comments after his touting this brand of rosin. Most were very favorable, saying how much the rosin improved their tone and how it helped with their bowing. I’ve never noticed one rosin was any better or worse. But that’s just me. I’m certainly not an expert on rosin. I’ve used Hill’s Dark Rosin, Magic Rosin (fun because it shines), Pirastro Cellisto Rosin, and Salchow Rosin (really cute in a heart shape). But I was inspired by all the rave reviews. Always grasping for that “magic” that changes my tone from struggling adult beginner to sultry du Pré. So I made the leap and shelled out $32 for a cake of the Andrea rosin. I was pretty excited when it finally arrived- 2 days thanks to Amazon. I rushed to my cello, whipped out my bow, rosined it up, and turned on the Korg. After being sure I was in tune, I pulled out something lovely and romantic- Shubert’s Standchen Serenade. New, but I could play it. I played and listened. Recorded a few measures. Listened carefully. Played again and recorded again. My analysis: It’s just rosin. No magic. For me, there isn’t any substitute for playing, listening, and experimenting. It’s just that simple. When I’m starting a new piece, I like to find YouTube videos and listen and watch how the pros do it. But as we all know, there are many ways to play a piece. There are choices to be made about fingerings, bowings, dynamics, and a multitude of possible means of expression. The thing to remember is this is music. It’s art, not math. There is no right or wrong. If you can justify what you’re doing (“I really like how this sounds”) you’re AOK. So in this light, I stumbled across these two violinists who are extremely funny as well as talented. I’ve watched several of their videos, but this one fits my thoughts about having many choices to make while making music. I played Faure’s Elegie at a performance of amateur musicians. We had a wonderful, large, very accepting audience. I was amazed that so many people came to a performance like this. It wasn’t free and it was on a Friday night, but it was standing room only. 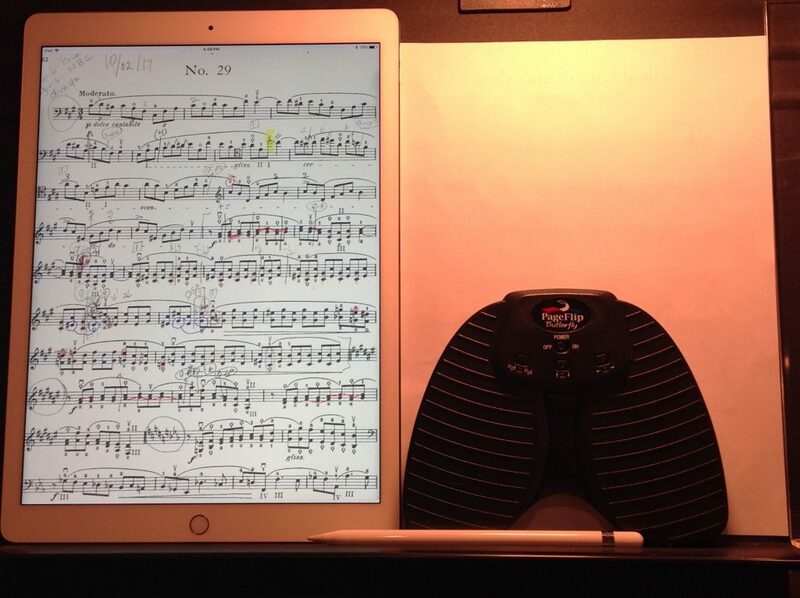 Both the pianist and I were using our iPad Pro’s and foot pedals, as was one of the other musicians. When the “concert” was over, the director opened the floor for questions. I was so surprised when all the questions were about our use of the devices and how we incorporated technology into our musical world. (No one was interested in “Why Faure Wrote The Elegie”.) We were very happy to share how much we loved making this change. So here’s an update on my transition away from paper. It’s fabulous. I have all my music in setlists on the Pro. I can scan music I already have or download directly from IMSLP into my dropbox file, which is then a tap of a button to put it into my Pro. The For Score program is wonderful. I can add/subtract/rearrange pages. I can highlight, erase, add symbols, and write notes in black, blue or red. I can mark “turn” on the page so I remember to do a 1/2 page turn which allows me to see the music I’m playing on the bottom half of the page while the top half of the next page is on the top of my page. In other words, I always have the notes in front of me. I can record what I’m playing, have a metronome beating (or blinking), or bring up a little piano keyboard so I can play those notes that just don’t seem “right”. I’ve even learned the correct way to back it all up so nothing will be “lost”. No more hunting for music through all my binders. No more grabbing the wrong orchestra folder. 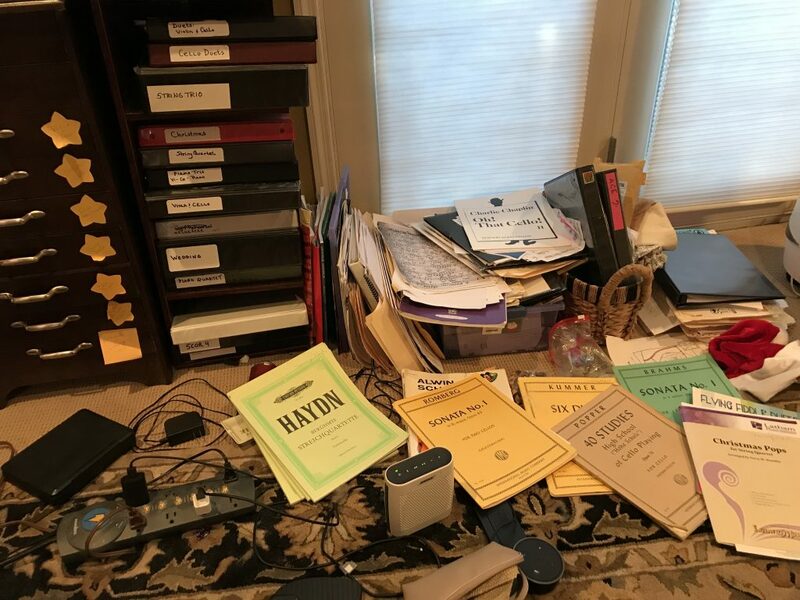 Everything is in one place which makes it easier to practice as well as carry to lessons or rehearsals. And speaking of that, I gotta go practice! Go Pro! Ummm, PRACTICE! Old joke, but still funny. Practicing isn’t the same as playing. Of course you’re always “playing”. But to practice is to focus on a problem and try different avenues to solve that problem. Playing is when you’re just enjoying the music, playing an entire piece. It’s what happens after you practice. Effective practice requires a plan and a goal- what are you going to work on. What do you want to achieve. You need to have a setting with all your tools- metronome, pencil, music, rosin, instrument, and closed door. It is quite annoying to be working on a shift, or a measure of “bow only” only to be interrupted by an inquisitive pet or ringing phone. Once you’re in the “zone” you can accomplish a great deal. I set a timer (thanks, Alexa) for each item I’m going to work on. Usually 20 minutes for something really tough that requires intense focus. Difficult measures that require slow, methodical finger choreography. I like to play my orchestra music along with a real orchestra, so I have recordings in my Amazing Slow Downer and I can play along with these (at a tempo I can play). But this only comes after I have located the problem areas (faster, complicated runs) and spent my 20 minutes on those. You need to find out what works for you. I like to keep a spread sheet of what I’m working on, what measures in each piece need extra attention. It helps me remember what I need to do. Make your plan, set some goals, and go practice. Every little bit is another step up that mountain. I think I’ve entered the 21st century. No more copying music. Granted it will take a long time before my savings on ink and paper equal the cost of an iPad pro. But combined with the app “ForScore” and a foot pedal, it’s a whole new world for me. Here’s how it works. I find some music on IMSLP, or something I’ve already saved to my hard drive. I transfer it to my Dropbox account, tap a button on my ForScore app and the music is in my iPad. I can put the music in multiple set lists (cello duets, cello trios, orchestra music, cello and piano…). I can mark up the music with black, red, or blue ink. (Probably more colors- I’m still exploring.) I can highlight with yellow or erase. [I can actually erase those notes I don’t want to play and put rests in their places, or change 1/4 notes to 1/8 notes.] I can make the page larger or smaller. Here’s some more cool things about ForScore: There’s a metronome that will be audible or flash on the sides of the page. Very cool. There’s a little piano so you can play passages that you need help with hearing. You can make little notes to yourself (“Don’t forget the D sharps!”) that will pop up for a few seconds when you bring up the music. and more and more. Check here to learn about this very cool app: https://forscore.co. And now the VERY BEST PART: The foot pedal. There are many options for buying one of these. I paid $89 and am using a “PageFlip Butterfly”. Easy to use. You press a pedal and the page turns. (You can also just tap the page and it will turn.) AND TO MAKE IT EVEN BETTER: There is this little item called a 1/2 page turn, so that you can have the top half of the next page showing before you have finished the first page. You are never without the music in front of your eyes. For me, this is amazing. It’s fun too! And best of all, I always have all my music with me. I have 2 cabinets filled with music. A dozen 3 ring binders, of various colors, filled with music. And a floor with tubs and music spilled on the floor- whatever music I happen to be working on. That was then. Now, I have an iPad pro, an Apple pencil, and a foot pedal. No more paper. No more ink. No more copying. It’s pretty incredible and I feel like my life has changed immeasurably. All it took was one time getting halfway to my rehearsal and realizing I had picked up the wrong binder of music. I’d been thinking about this for a while, but a) it’s expensive and b) I already have all this music. Copied, marked up, and in those 3 ring binders. Well, now all my music is in this one device. The floor is clean and I’m thinking about boxing up all those binders. More about this delightful life changing event to come!